1909 Company founded by Maurice Woods. 1928 Private company incorporated as M. W. Woods Ltd.
1935 Geoffrey Wood, son of the founder, became MD. Production of propellor fans and electric motors to drive them. 1945 GEC acquired 50% of the ordinary shares and a majority of the preference shares but the company continued as an independent associate. GEC became responsible for sales. 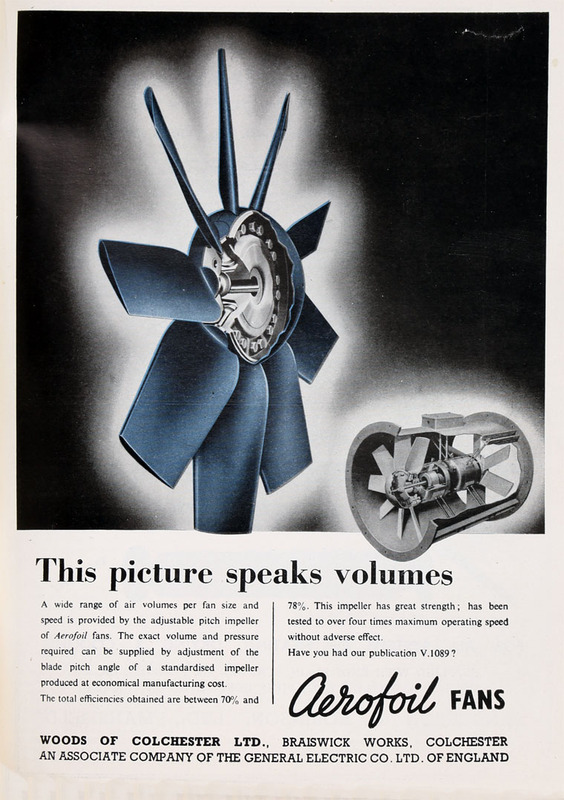 Postwar: introduced axial flow fans; Xpelair fans for use in kitchens and bathrooms. 1953 Advert: an associate company of GEC. 1954 Built up home sales organisation so reducing use of GEC for sales. 1957 All UK sales were handled by the company. 1962 Converted to public company to acquire business of electrical and general engineers of the same name. At this time, the company purchased heat exchangers from a separate company, Air Exchangers Ltd, owned by Geoffrey Woods and located in factories in Colchester leased from the company. 1964 Acquired Whittingham and Mitchel, marine and structural engineers. 1966 GEC acquired the rest of the shares. 1968 GEC acquired Keith Blackman which would be joined with its Woods of Colchester subsidiary. This page was last edited on 28 November 2016, at 23:41.